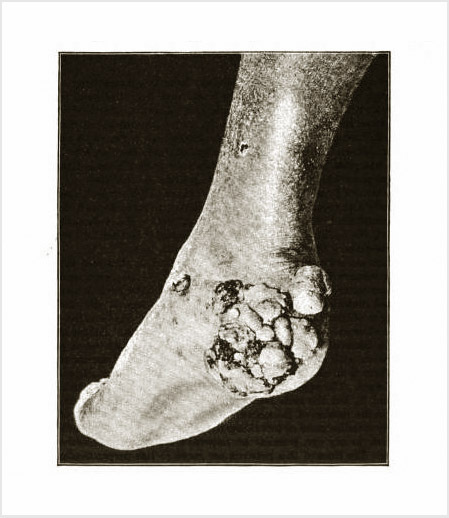 Report of a case of the mycosis fongoïde of Alibert. Journal : Journal of cutaneous and genito-urinary diseases ; vols. 6, 7. New York : D. Appleton and company, 1888-1889. Description : vol. 6: 256-265 p., 281-293 p. ; vol. 7: 441-447 p. ; ill.: 2 phot., 5 engr. ; 26 cm. Photograph : 2 in-text photoengravings in volume 7 (unverified). Subject : Skin — Cutaneous T-cell lymphomas ; Alibert-Bazin syndrome. Author caption: By HENRY WM. BLANC, M. D., Dermatologist to the Charity Hospital, New Orleans; Lecturer on Dermatology, Tulane University of Louisiana; Instructor in Dermatology and Syphilology, New Orleans Polyclinic, etc. Medical degree, Tulane Medical School. Reprint: Blanc (1893), Selected monographs on dermatology, London: New Sydenham Society, vol. 143 (317-340). Index Medicus: 21102651100, 20204061230 (offprint).